We are in fundraising mode! Greetings Everyone, The Alburtis Lockridge Historical Society wants to thank everyone in advance who reads this campaign. Our headquarters is the Lock Ridge Memorial Presbyterian Church. The church was built in 1870 for the workers and families who worked for the Thomas Iron Company in Alburtis. It's truly an amazing church. Within the past year, The Borough of Alburtis took over the ownership of the church and plans of restoring it to its glory. The only thing is is that borough cannot fund raise for doing such projects. Our Historical Society is starting to fund raise in an effort to raise necessary funds to perform the restoration. The church is in need of some structural work, electrical upgrades and cosmetic upgrading. So join us in raising funds to restore her to her glory to what she used to be. Please click on the link on the right! Thank you!! The Alburtis Lockridge Historical Society announces one of our fundraising effort. 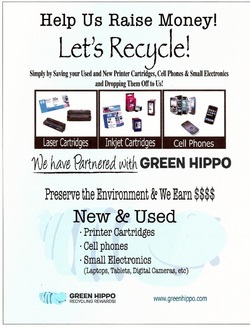 We have started to collect used up printer cartridges, used cellphones and small electronics. Items can be dropped off at any of our open houses or events! If you can't drop them off, please contact us to arrange something. Contact us about how you can help us raise some additional funds! Thank you! !